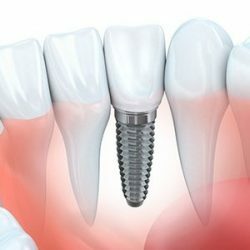 A dental implant is a piece of metal that looks like a screw and is put into the jaw where the missing tooth’s roots were. Over time, bone grows around the implant, which helps to hold it in place. An artificial tooth, or crown, is then attached to the metal to fill in the gap left by the missing tooth. The crown is specially made to look like your other teeth in size, shape and colour. Dental implants can also be used to hold a dental bridge or dentures in place. One way in which dental implants really stand out from other tooth replacement procedures is that they are a permanent solution. All the other replacement options have their benefits and uses, but they all need to be replaced over time. Once an implant is successfully done, it’s there for the rest of your life. So long as you take good care of it, it isn’t going anywhere. A lost tooth can affect your whole mouth. It can cause bone loss, it can cause your gums to recede over time, and it affects the health of all your teeth. When a tooth is lost, the remaining teeth start to crowd together in an attempt to fill the gap. This can have numerous health repercussions for you, none of them good. Getting a dental implant restores balance and equilibrium to your mouth, keeping your teeth from getting overcrowded or crooked. Losing teeth can cause your face to sag and appear sunken and sad. Implants restores the natural shape of your face. It also makes for a healthier and fuller smile. An added benefit of dental implants is that they can correct any lisps or speech impediments caused by tooth loss. Fixing an impediment doesn’t just give you peace of mind- It also makes you more effective at communicating with others which can improve your quality of life. When you lose a tooth, it creates instability in your mouth. As your teeth move around to close the gap, it begins to wear away at the density of your jawbone. If you don’t get missing teeth replaced, over time your jaw will get weaker and weaker. Dental implants halt the movement of your teeth and because they’re implanted into your jawbone, it reinforces the bone and gives it an anchor to keep it strong. Dental implants look just like natural teeth. They have one advantage over natural teeth: They can’t get cavities! Your implants can get dirty and suffer some wear and tear over time, but they can’t develop cavities or abscesses the way regular teeth can. Dr Aashul Patel at Parklands Dental is trained in the field of replacing missing teeth and has been placing dental implants for over ten years. He is happy to sit down and explain the process to you and put you at ease that it isn’t a complicated procedure to have. If you can any questions or queries do not hesitate to contact the Parklands Dental team.